A West Coast judge is putting an end to the Trump administration’s practice of sending Central American asylum-seekers back to Mexico while their applications are processed and hearings scheduled. According to Vox.com, the ‘Migrant Protection Protocols,’ sometimes referred to as the ‘Remain in Mexico’ policy, resulted in at least 600 asylum-seekers being booted across the U.S.-Mexico border since January. Nearly half of the migrants ordered to leave the United States were ejected within the past two weeks. Vox attributes the drastic uptick to the Department of Homeland Security, which has adopted an increasingly active role in border affairs. In his Monday ruling, Judge Richard Seeborg of the United States District Court for the Northern District of California found that current law doesn’t permit the removal of asylum-seekers whose applications remain undecided. The New York Times notes that the decision—not surprisingly—was hailed by Trump’s critics. It’s the latest ruling in a years-long series of opinions, verdicts and determinations against Washington’s hardline immigration policies. 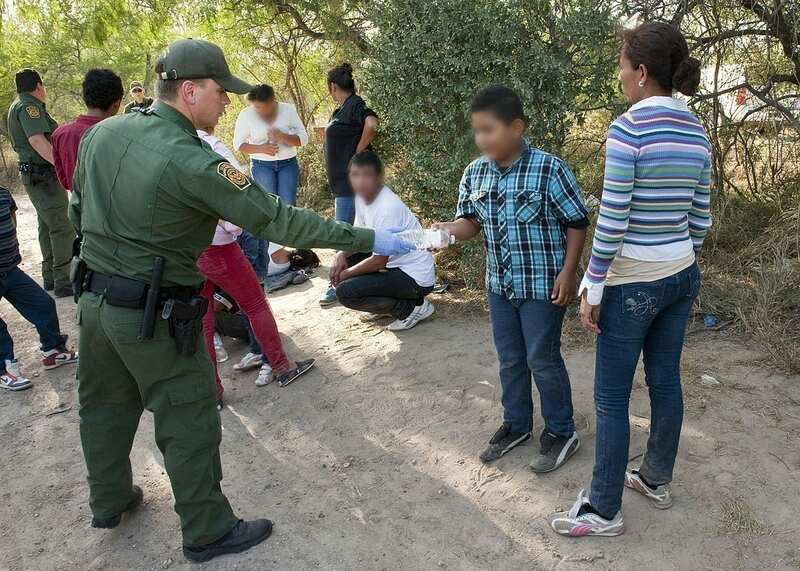 A U.S. Customs and Border Protection agent offers water to children after they illegally crossed from Mexico into Texas. While net migration from Central America and Mexico into the U.S. has dropped in recent years, unauthorized entries of unaccompanied minors has risen. Image via U.S. Customs and Border Protection Service/public domain. The protocol, writes the Times, was put into place following deliberations with the Mexican government. Washington appears to have misinterpreted or misapplied passages of the Immigration and Nationality Act, which allow Washington to return migrants to the “contiguous country” from which they’d entered the United States. Seeborg upheld that ordinary immigrants can still be deported or temporarily removes from the U.S. under the Act’s provisions. But, Seeborg says, the Trump administration cannot refuse reasonable accommodations for asylum-seekers. According to the judge, the administration was implementing the policy in such a way that asylum-seekers were forced to meet an “unusually high standard” to prove they’d be persecuted in Mexico. Vox notes that the ruling can only complicate affairs for the Department of Homeland Security, which was recently thrust into administrative chaos. On Sunday night, the agency’s secretary, Kirstjen Nielsen, resigned from her post, purportedly under pressure from Trump himself. And inside sources have told media that presidential aide and Trump confidante Stephen Miller is pressuring other senior DHS officials to vacate their posts, too. The administration is expected to appeal Seeborg’s decision. Ryan Farrick is a freelance writer and small business advertising consultant based out of mid-Michigan. Passionate about international politics and world affairs, he’s an avid traveler with a keen interest in the connections between South Asia and the United States. Ryan studied neuroscience and has spent the last several years working as an operations manager in transportation logistics.